If you’re registering a vehicle in Illinois, you can choose a variety of customized license plates. Alternatively, personalization allows you to add custom characters for your plate number. When you register your vehicle with the Illinois Secretary of State (SOS), you can choose from a variety of different license plates available. 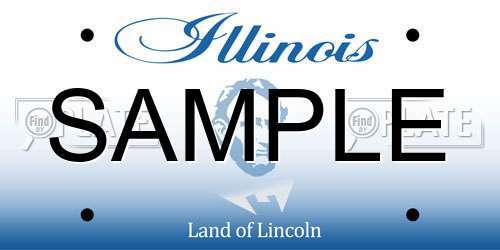 The standard Illinois license plate has a blue and white background with an image of Lincoln and dark red lettering. If you don’t want to register a standard plate, you can also obtain a customized plate. See below for more information about customized plates. There are also plates and placards for people with disabilities which allows them to park in designated parking zones throughout the state. All of these plates have the option to be personalized. To obtain these plates, you must have proof of enrollment with the American military services. If you are eligible, you must pay the required fees to obtain these plates. Some of these custom plates are provided for free, for example the Ex-Prisoner of War license plate. Antique plates cost $30 (every 5 years) and will only be issued to vehicles that are 25 years and older. You must also keep the vehicle in original conditions, any modifications could disqualify your application for the antique license plates. To register for these plates, you must pay $40 to order and $27 to renew. These fee contribute toward scholarships at the corresponding universities. These organizational plates range from $25 to $40 to order. Some of the money from these fees will be donated to the organization. You will be expected to pay additional fees each year for renewal. Contact your local Illinois SOS for more details about custom license plates. If you are registering a vehicle for the first time (i.e. it doesn’t have plates), you’ll have to pay the standard registration fees in addition to any fees for specialty or personalization of license plates. Note: You have 20 days to register a newly bought vehicles and 30 days to register an out-of-state vehicle (for new residents). After you have contacted or visited an office, you will receive new stickers to place on your license plate. You must renew your plates before the expiration date to avoid late fees. If you have brought your car from out-of-state or have purchased a new vehicle, you may require temporary license plates. Temporary license plates in Illinois allow you to drive legally while your regular plates are being processed. Temporary license plates in Illinois are valid for 90 days. The only way to transfer license plates to another person is if they are the joint owner (i.e. spouse or close relative). Otherwise, you are the sole owner of your license plate and you will keep your plates after selling or donating your vehicle. If you’re transferring your plates over to another joint owner, you will also be required to fill out form VSD 393: Affirmation of Correction. In the event that you license plates have been stolen, removed, or lost, you can get them replaced by the SOS. You can apply for replacements online or by visiting the nearest office. You may have to wait to receive your new plates and you should contact the SOS office in case you want to have the same plate number. If you sell your vehicle and don’t get a new one, cancel your car insurance, or move to a new state, you’ll have to surrender your license plates to the nearest SOS office. If you intend to personalize your license plate, you should always look up available license plates prior to going to the SOS office. Here you can search for available plate numbers and get some background details for vehicles registered with a license plate. Start your first search to look up license plates in Illinois.